In the alleviation of the vast width and depth of mankind's suffering, homeopathy is one of the most scientific systems of healing available today. Samuel Hahnemann established and developed a thorough methodology with clear practical guideÂ­lines based on an insightful philosophy. Despite this, a scientific mindset is scarcely found in homeopathy. The very word "sciÂ­ence" may even call up feelings of antipathy in many homeopaths because it is associated with the lack of recogition homeopathy has been treated with until today from evidence-based conventional medicine. 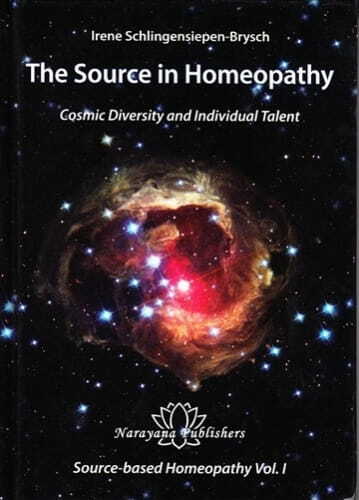 However, to attain a healthy balance in itÂ­self, and to move forward in its developÂ­ment, homeopathy sorely needs a cross-ferÂ­tilization through inputs by scientists from other fields of knowledge and research, even those seemingly opposed to homeopÂ­athy such as conventional medicine, or disÂ­ciplines operating ostensibly far outside the homeopathic domain. And homeopathy needs homeopaths with an open scientific mind looking for answers to bold questions, instead of clinging to firmly-held beliefs. Irene Schlingensiepen-Brysch is a scientist who used to work in a field very different from homeopathy; after becoming a hoÂ­meopath she maintained her scientific attiÂ­tude, striving to verify her results and lookÂ­ing for the Source and methodology behind successful prescriptions. In Irene the left side of the brain unites with the right one, analysis meets synthesis, male reaches out to female and east meets west. Here are some expressions you will encounter in her writings to illustrate this: "following irregularity in free associations as expressed by the patient is an essential tool in case-taking"; "if the therapist is no longer able to follow the patient this indiÂ­cates they are close to the Source." This book describes Irene's journey to unÂ­covering the Source of disease as well as the Source of healing and is the result of the alchemic process that has taken place inside her when she crossed the boundaries of the prevailing material paradigm to enter a new spiritual one. A variety of fascinating cases are offered as examples of how in case-taking the patient can be led or folÂ­lowed to start expressing the Source diÂ­rectly. What then is this Source? First of all, in the context of homeopathic practice, the Source indicates the substance which may heal the patient when prepared homeo-pathically. At the same time this substance is defined by Irene as the Source of the talents an individual is meant to express in life. In this sense the simillimum is simultaneously the Source of healing and the Source from which the higher purpose of life is meant to unfold itself. What more exciting journey could a homeopath under Â­take than the one leading to the very Source of an individual's being? Using 24 remedy pictures of cosmic origin -such as Sol, Helium, Positronium, Meteorite, Brass, Volcano, Precious Stones, and Geyser -the author shows how we can accompany our patients on the journey into their unÂ­conscious and help them to name the Source of their remedy. This may even be a remedy that is so far unknown to homeopÂ­athy, yet which is nevertheless capable of bringing about profound healing, even in serious illness. This carefully edited book published with hard cover and high printing quality I can recommend to any homeopath interested in exploring the boundaries of homeopaÂ­thy.